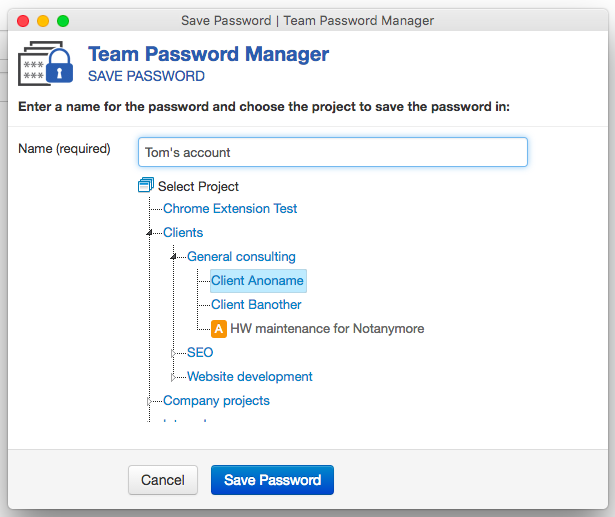 Some days ago we released two new products that work with Team Password Manager: an extension for Google Chrome and an importer for passwords (and projects) stored in the popular KeePass Password Safe password manager. Both products are still in Beta. Automatically fill the username/email and password fields of these login forms, getting the data from Team Password Manager. Save web credentials (URL, username/email, password) to Team Password Manager. Go to the Chrome Extension page to learn more about it and download it. KeePass Password Safe is probably the most popular and used single-user password manager. This summer we have developed a PHP script to import data (passwords and projects) from KeePass XML 2.x files into Team Password Manager. While you coud previously use the built-in importer to import CSV files exported from KeePass, there were two major problems: one was that KeePass CSV format is not compatible with ours and the other was that you couldn't keep the hierarchy in projects. So you could do it, but you needed to manually change the CSV files and do several imports to keep the hierarchy. Another approach we've been recommending is to use the Team Password Manager API to build an importer from XML files exported from KeePass. So basically we took our own recommendation and built it ourselves for all of you! The result is TPM-Keepass-Import, a free PHP script which is also released in source code form so that you can suit it to your needs. Go to its page to learn more about it and to download it. We'd like to thank all the users who have given feedback on these two products, and encourage everyone to do the same. Every opinion is welcome!